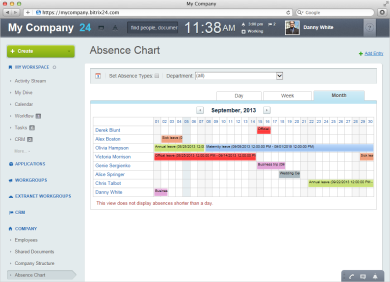 Bitrix24 is probably the best and most popular free online HR suite. Essentially it’s a fully featured HRMS with features ranging from intranet to company orgchart to self-service portal to leave management and even employee training and onboarding. Well worth a look. Essentially a Bitrix24 clone with fewer functions but free is free. Trello is a great free project management solution from Fog Creek Software. Personally, I am not a big fan of Kanban methodology, but there are a lot of people who swear by Trello. Weekdone is an Estonian startup founded by former Skype engineers. Essentially Weekdone is a free workreport and employee feedback system. One of the few tools on this list, along with Bitrix24 and Trello that has a great mobile app. The name may suggest that Workflowy is a workflow or business process automation tool, but it’s not. Rather it’s online organization tool that lets you create todo lists, brainstorm, and plan. Workflowy is quite popular among HR professionals. You may wonder what a CRM system is doing among hr tools, but this social CRM can be used as great recruiting and resume management tool. Matt Charney of RecruitingBlogs explains. Nimble is 100% free for solo use. AnyPerk is not free, but at $5 per employee per month, it’s a steal, especially for companies that don’t offer any benefits. Do you know of any other free HR tools that we overlooked? Make sure you leave a comment.